There is no way I can accurately grasp Guerlain’s Vol de Nuit, probably ever. I had been stuck in the drafting stage for this elegant 1933 creation for about two weeks before I felt confidant enough to start something. Considering my troubles, I expressed incredulity to the ravings of this perfume. A mossy chypre of sorts – Vol de Nuit is often held on the highest pedestal in perfume speak, credited for its elusiveness and its (lack of) structure, breaking away from the typical Guerlain confines of the time – think Shalimar, Mitsouko, and L’Heure Bleue. This fragrance is a nocturnal creature at times, an owl of sorts, as its quiet attitude promotes an air of mystery and subtle confidence. But sometimes, I am met with a great winged bird sturdily escaping from the skin. However together, Vol de Nuit’s two dimensions are expressed in the same juncture of wearing. Like a gust of cool wind behind the neck then covered with a soft shawl, Vol de Nuit breaks away from the typical structure of Jacques’ Guerlain perfumery techniques, a structured overloading of sorts, and what remains is poetry, finesse, and spirit. Vol de Nuit is most notable for its large dosage of galbanum in its overall composition, and I can only assume the original Miss Dior was inspired by Vol de Nuit. Galbanum is an incredibly bitter and green resin, found in this fragrance giving it its famous dizzying effects. For me, in the most romantic way possible, Vol de Nuit is the sweeping loss of breath and the escaping weight on a long diving descent, or similarly, perhaps it is the relieved anticipation of an ascent. Relevantly, Vol de Nuit was inspired by Antoine de Saint-Exupéry’s novel: Vol de Nuit (Night Flight). A pilot as well as an author, Night Flight describes mail planes flying in the night and how a mail plane is hit by a cyclone during flight. Expansive, exploring, and ultimately daring, Vol de Nuit (the fragrance) explores a sense of uncertainty, with excitement evolving from initial terror in the scenting mode. As the bracing green hits, it is compounded in a swirling cyclone of notes. Simplistically, and for me most definitely, Vol de Nuit is a quasi-Mitsouko, or at least something of mossy-chypric structure lifting into the air up to dizzying heights. 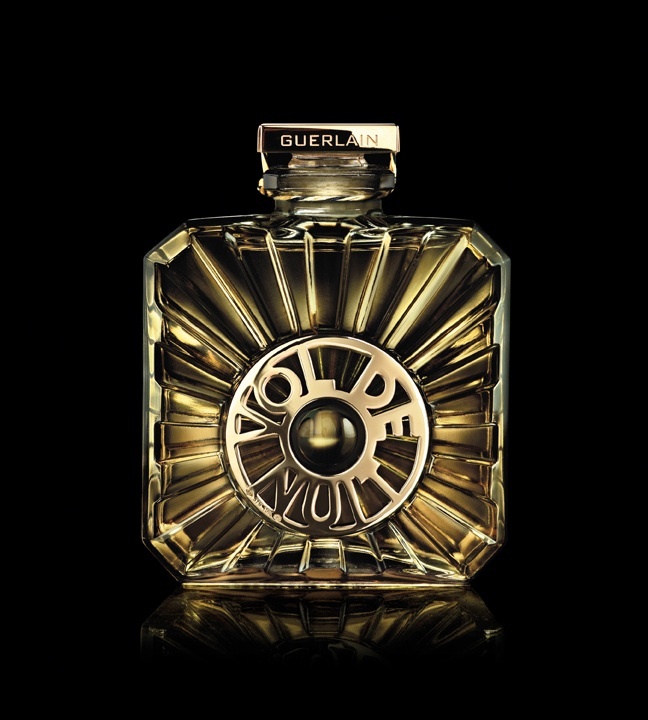 The Guerlain vanilla is present, as the complexity of the chypre category is too. Yet, whilst I say this, its structure is lessened, there’s no tightness to this perfume – it welcomes you to spritz freely. For me, in a rather fanciful sense, it’s the accords of this fragrance given space, not the individual notes – it’s a beauty seen from an unusual angle, and this angle is often not seen. This beauty appeals to the critical-intellectual faculties, overriding the senses. Hesperidic notes with aldehydes prepare you for take off, as the bitter galbanum and cold narcissus is pillowed on a trail of orange blossom, vanilla musk and orris powder. This represents the cool of the midnight sky and the wispy random clouds as the plane breaches through. In the midst of uncertainty comes a velvety comfort, as the powdery iris-driven accords take over. Vol de Nuit promotes languidness and sleepiness, but in doing this it never jeopardises itself. I dig deeper and find an amber (Très Guerlain) softened and downplayed to accommodate itself amongst the powdery notes. As I find myself reaching this fragrance at its very core, I uncover the complexity of these bittersweet powders rushing by, mixed with the briskness of daffodil and galbanum, with a salty ambergris-like effect appearing at times. It smells nostalgic, slightly old and mature in character, as it aches at the wearer to return to a place they ache to go back again. Vol de Nuit for me is a return to comfort in the company of others, and much like the general theme of Night Flight, it begs to return to solidarity and company. It twinges the heart with all of its ambiguity – it is stunning during this middle stage of wear, as it fluctuates styles reminiscent of orientals and chypres concurrently. Vol de Nuit remains on skin like a thin chiffon veil, as a mossy earthiness stays firmly grounded. The balsamic oriental theme is still present, perhaps the only constant in this perfume as benzoin, sandalwood and vanilla add the only sense of structure identifiable. But, the pleasure here is found in the projected uncertainty of Vol de Nuit and its diaphanous quality. A true testament to Jacques Guerlain’s skill in blending. Vol de Nuit is totally indescribable. It is a journey for the skin as this fragrance allows itself to fleet and unfold in an orderly fashion. Allow yourself to explore new horizons. This entry was posted in Guerlain and tagged Fragrance, fragrance review, Guerlain, Perfume, perfume review, Review, Vol de Nuit. Bookmark the permalink. Lovely review. I’ve never had a chance to smell this one. It’s hard to go wrong with the older Guerlain’s. Poodle – it’s a must that this is smelled. Although, I found that it was underwhelming when I first smelled it. You may need to visit this in a private place. Nice article Liam. I’m so glad you like this scent. It’s one of my all time favorites. There are so many composed French perfumes of this era that are wonderful but this really stands out as an amazing olfactory achievement. Occasionally TCM will show the long lost movie version of NIGHT FLIGHT and I will geek out wearing the fragrance while I watch it. LOL.